In the T20Is, India are ranked second with Pakistan. Even though India have lost two major overseas Test series this year, it has not affected their ranking in the longest format. Besides, their captain and ace batsman Virat Kohli, too, has continued to occupy the top slot in the International Cricket Council’s (ICC) rankings for Test batsmen in the latest update which was announced on November 1, reports said. 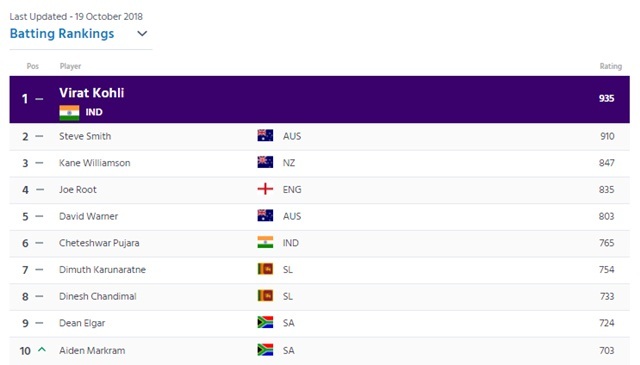 Kohli, who overtook Australia’s Steve Smith, who is serving a year-long ban at the moment owing to his involvement in a ball-tampering case in South Africa, in England and became the top-ranked batsman, has now 935 points. Smith, on the other hand, has 910 points. The next-best Indian in the list is Cheteshwar Pujara, who is at No.6 with 765 points. Kohli, however, was not the highest run-getter for India in their latest Test series, which they played against the Windies. Debutant Prithvi Shaw, who slammed a debut ton in Rajkot, was India’s top scorer in the series, scoring 43 runs more than the captain. 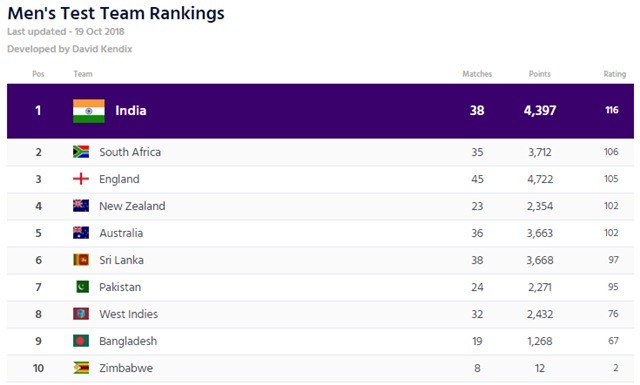 In terms of team ranking, the 2-0 whitewash of the Windies ensured that India remained at the top. They now have 116 points, having 10 more than the second-placed side, South Africa. Though India have won several Test series at home in a row now, they lost their last two away series – 1-2 to South Africa and 1-4 to England – this year. The Windies, on the other hand, remained at the eighth position in Tests with just 76 points. They are 19 points behind Pakistan, who recently beat Australia 1-0 in a two-Test home series, while Bangladesh are just nine points behind the Caribbeans. 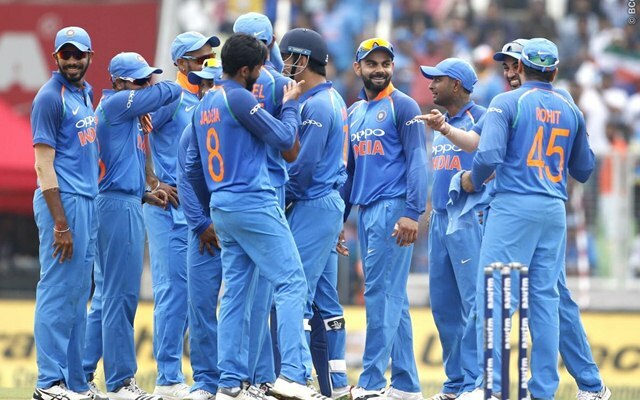 In the ODIs, India are ranked second at the moment with England occupying the top slot with a lead of five points. In the T20Is, too, India are ranked second with Pakistan occupying the top position with a 12-point lead. Kohli is also the No.1 batsman in the ODIs with 884 points, 42 more than compatriot Rohit Sharma, who is in the second position. David Warner or Steve Smith to play alongside Virat Kohli for Surrey?